Join the campaign for tenant solidarity! Comments Off on Join the campaign for tenant solidarity! 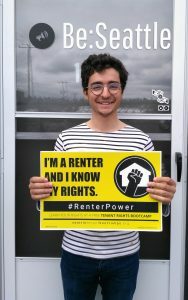 Join other tenants and declare that our knowledge is our power! Let it be known that you know your rights! This simple action repeated across the city can create solidarity among tenants and put bad landlords on notice. It lets other tenants know that they are not alone and sends the message to those bad landlords that we have each others’ backs. Participation is simple. All you need to do is put the sign up in your window. We’ll even drop it off on your doorstep.